In early November, Kelly Rowland gave birth to her first child, Titan, with her husband/manager, Tim Witherspoon, and we already have indications that this second Destiny's Child baby is going to be spoiled with love. 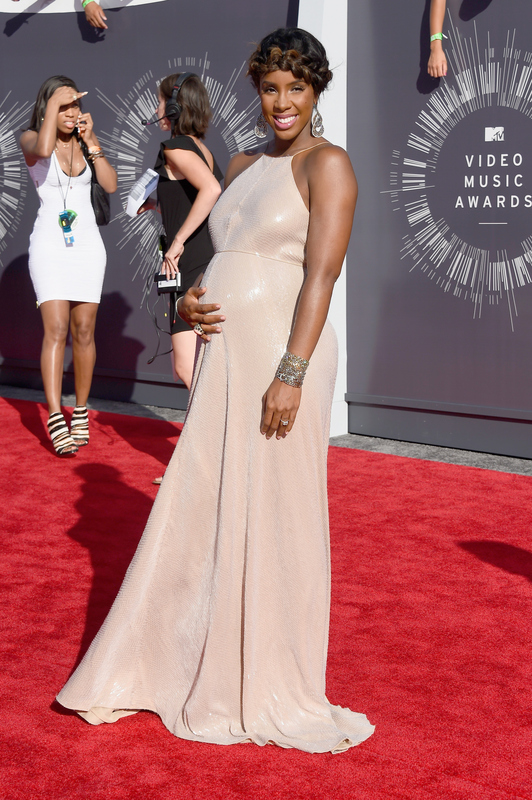 Kelly Rowland dedicated a song to her new baby — yep, already! On Monday morning, Rowland took to her Instagram account to dedicate a post to Titan for the first time since his birth. In a video post titled, "A song for Titan," she posted a short clip of a ballad to her son, the only audible lyrics being, "You will always be mommy's little baby." The beautiful ballad is available in full on Rowland's official SoundCloud, and was produced by Verse Simmonds and The Order. This is the second big public honor Titan has received in his very short time in this world. Following the announcement of his birth, there was no doubt that fans were awaiting for a word from Queen Bey to her best friend and new baby. As usual, Beyoncé delivered in a tear-inducing way, posting a beautiful tribute for her "sister" Rowland and new nephew, Titan, saying, "I've always dreamt of our little ones growing up together. I'm so thankful for our bond. Baby Ty, I love you so much." Now, that is a lucky baby. Baby Ty is only a week only old and he's got a song written in his honor, but he's not the only kid lucky enough to have inspired beautiful music by some of the most talented artists in the world. Here I rounded up some of the most inspirational and touching tributes written, so get your tissues ready, because you might be a mess after this. Of course I had to include this precious song that Beyoncé wrote for Blue Ivy. Mama Bey sings on the last track of her self-titled last album, "Each day I feel so blessed to be looking at you, 'cause when you open your eyes, I feel alive, my heart beats so damn quick when you say my name, when I'm holding you tight, I'm so alive." Madonna penned this track for her Ray of Light album which was inspired by her daughter, Lourdes. Lyrics include, "You are a treasure to me, you are my star, you breathe new life, into my broken heart." Radiohead is one of my favorite bands and Thom Yorke one of my favorite musicians, so I know that being outright sentimental is not "his thing." So in true Yorke fashion, he wrote a song for his son Noah on the band's Hail to the Thief album and it wasn't a typical ballad. Yorke sings, "Maybe you'll be president, but know right from wrong." He's got high hopes for Noah, and I think he's in good hands. If you were a child of the '90s, there was no way you could have not heard this bop that Will Smith wrote for his first son, Trey. Of course, the chorus was taken from the 1981 hit of the same name by Grover Washington Jr. and Bill Withers, but Smith added in his own raps. Smith's video is montages of various fathers with their young children and who can keep it together during a montage? I also really love how dated the lyrics are when Smith raps. He wants to keep up the changing times and the "101 Dalmations on your CD Rom." Awww, dads say the darndest things. You cannot deny Lauryn Hill's songwriting abilities, as she often spills her real life in heart wrenching details, as was the case when she got the inspiration for "To Zion." The lyrics recount how many people advised her to end her pregnancy, singing, "But everybody told me to be smart, 'Look at your career,' they said, 'Lauryn baby use your head.' But instead I chose to use my heart." There are many things of which make me insanely jealous of Zoe Kravitz's life, like the fact that she's so hot, she (reportedly) dated Penn Badgley and Michael Fassbender, she's in a cool band, etc, etc. Another thing to add to that list is that her super rad rock and roll dad, Lenny Kravitz, wrote her a lullaby with the sweetest lyrics: "God is for Zoe, and heaven's for Zoe/Oh, can you believe that everything is waiting to unfold?" Even though she's only two years old, Blue Ivy already has inspired two songs by two of the biggest stars on the planet — her parents Beyoncé and Jay Z. Jay dropped the song within a week of Blue's birth and she is the youngest person to feature on a song, as you can hear her baby babbling in the background. Jay raps to his baby girl, "The most amazing feeling I feel, words can't describe what I'm feeling for real, maybe I paint the sky blue, my greatest creation was you." So we all know Britney Spears isn't known for her insightful lyrics, but fans were in for a surprise when she closed out her her album Circus with the ballad, "My Baby." The lyrics were written by Spears for her two sons, Sean and Jayden and are simple and sweet: "My precious love, sent from above, my baby boo, God I thank you."